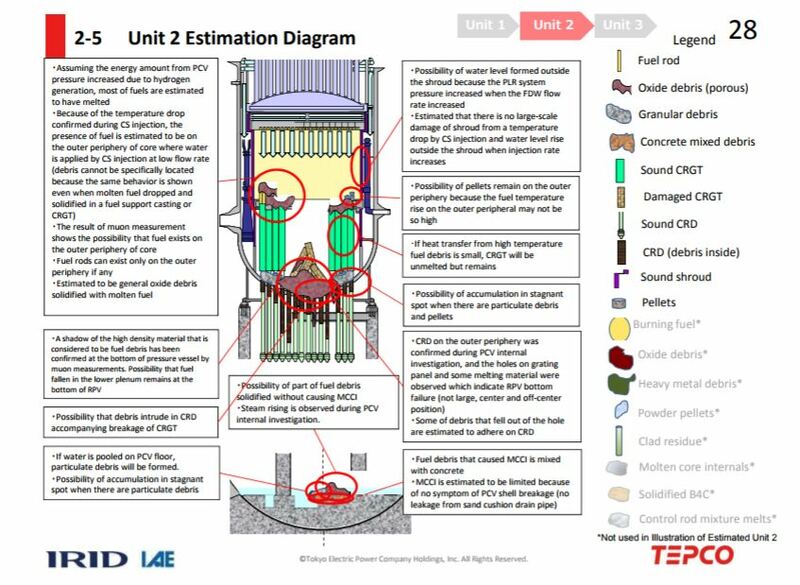 This is a continuing report on the new findings for the reactors at Fukushima Daiichi from the recent NDF Conference. We have broken down this information by reactor unit due to the size. This article focuses only on unit 2. 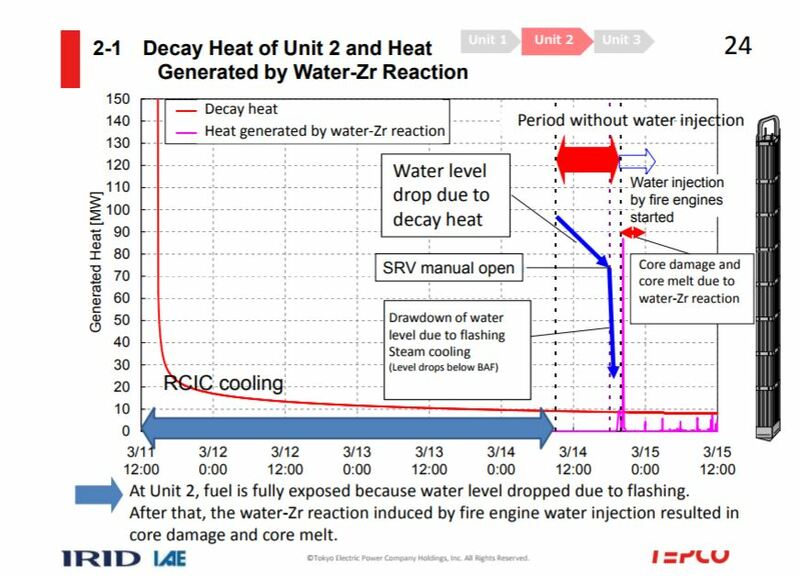 The decay heat graph above shows a steady drop in water levels in the reactor after the RCIC cooling system was lost. 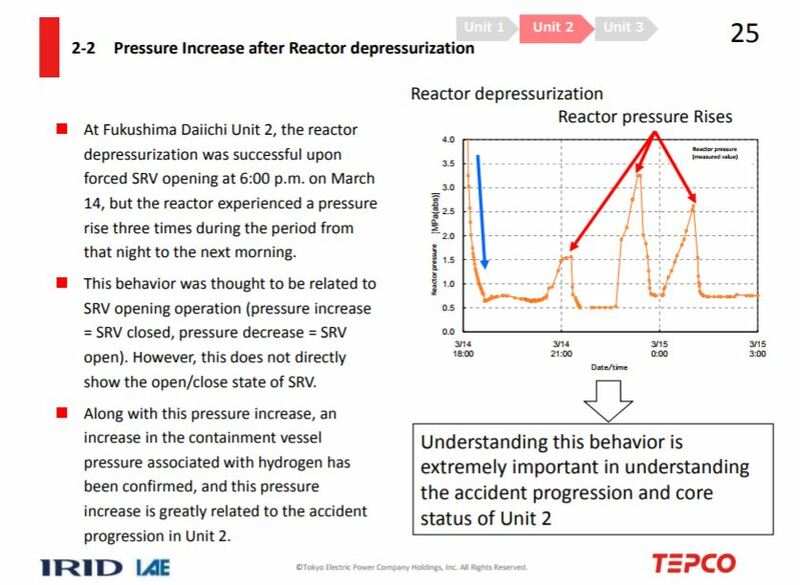 The point where they opened the SRVs (steam relief valves) valves that dump steam from the reactor vessel into the torus tube caused a drastic drop in the water level in the reactor. This show a known problem with using the steam relief valves. Without a significant way to replenish water or reinstate cooling systems, opening the SRVs will cause the water level to drastically drop as water leaves the vessel as steam. 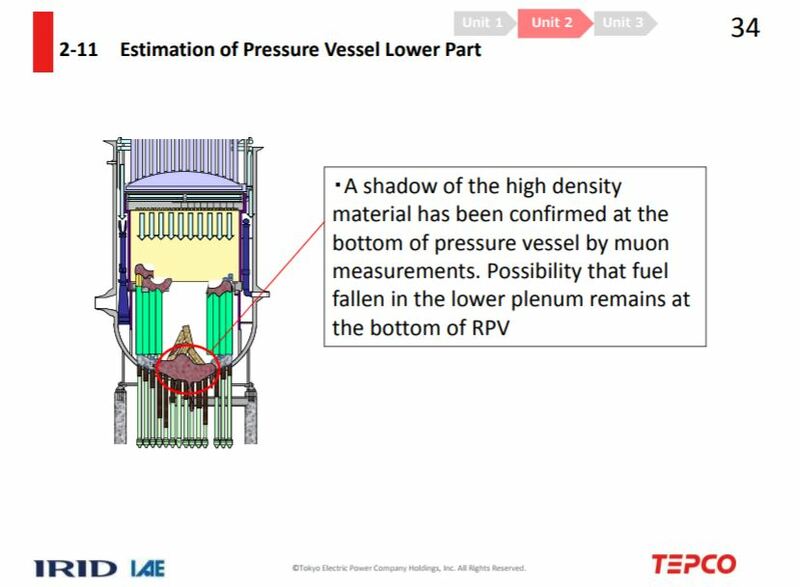 At the same time not opening the SRVs could cause the reactor vessel to continue to build pressure and catastrophically fail. The US nuclear industry touts a process they dubbed “feed and bleed” where they vent steam out of the reactor and replace it with cooled water. Without a way to “feed” the water, this just bled what water was left. 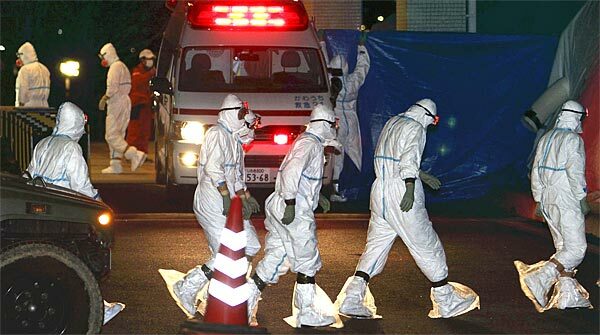 The point where the reactor water level plunged and the core melt peak is noted is quite short in time. Possibly as little as an hour according to the graph. The repeated pressure peaks show the abundance of steam and hydrogen being generated during the meltdown process. The top head containment gasket for unit 2 eventually failed during this process. This may have finally allowed a way for pressure from containment to escape before a larger failure took place. Other gaskets like the one on the CRD hatch were found to have melted and failed. The calculated result indicates that almost all of zirconium in the reactor reacted until the second peak. Estimated that most of fuel melted during the second peak from the relationship between hydrogen generation and energy generation due to water-zirconium reaction. The hours they consider to be the time frame of the fuel melting may have allowed enough time for a slow melt through. Sandia National Lab described their concept for unit 2 as having this kind of slow meltdown where the molten fuel did not leave the reactor vessel all at once. This slower type of failure of the reactor vessel could potentially allow the fuel to collect and burn down into the floor of the pedestal rather than collecting in a mass and then spreading across the containment floor to attack the edge. The latter scenario is assumed to then create a hole between the containment structure and the torus room. Such torus room damage has not been found for unit 2 after extensive inspections. The statement in the above diagram that the corium reaction with concrete (MCCI) was limited because there was no damage to the sand cushion may not be an accurate representation of the conditions. The sand cushion is a pocket at the edge of the containment floor where it connects to the torus room. This is distant from the pedestal area. If a slow melt through took place as Sandia’s estimates assume, the fuel may have burned down into the pedestal basemat concrete rather than spreading across the containment floor. Unit 2 also has an issue of an unidentified water leak in the containment floor. Inspections have confirmed that unit 2’s containment can’t hold a sufficient amount of water but also found no leaks via the torus tube or torus room. This leave the containment floor as the likely location of the water leak route. This would then assume some form of damage to the reactor basemat structures that allows water to leak out. We covered this issue in more depth in our extended report on unit 2. 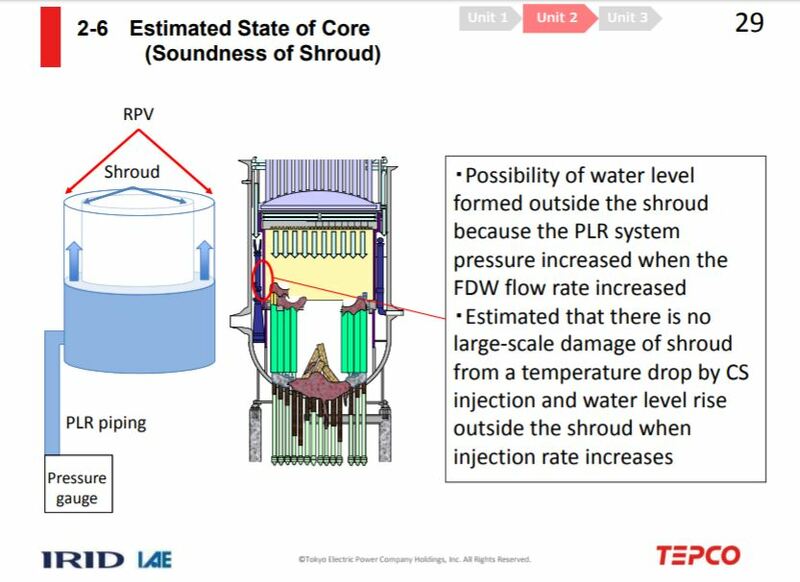 The estimates outlined above indicate they think the shroud structure inside the reactor vessel did not melt with the fuel. This would seem to support the idea that the unit failed in the center of the core first. The graphic above assumes that there is fuel remaining in the lower portion of the reactor vessel. There were two muon scans conducted at unit 2. The first one found no fuel at all in the reactor vessel. 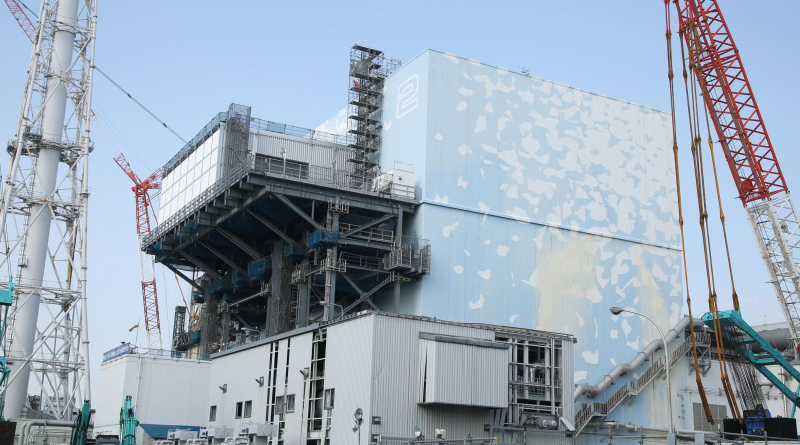 The second scan claimed they found some fuel in the lower section of the reactor vessel. Yet that scan view when run through refinement software did not show that to be the case. Our reports on these muon scans for unit 2 can be found here. 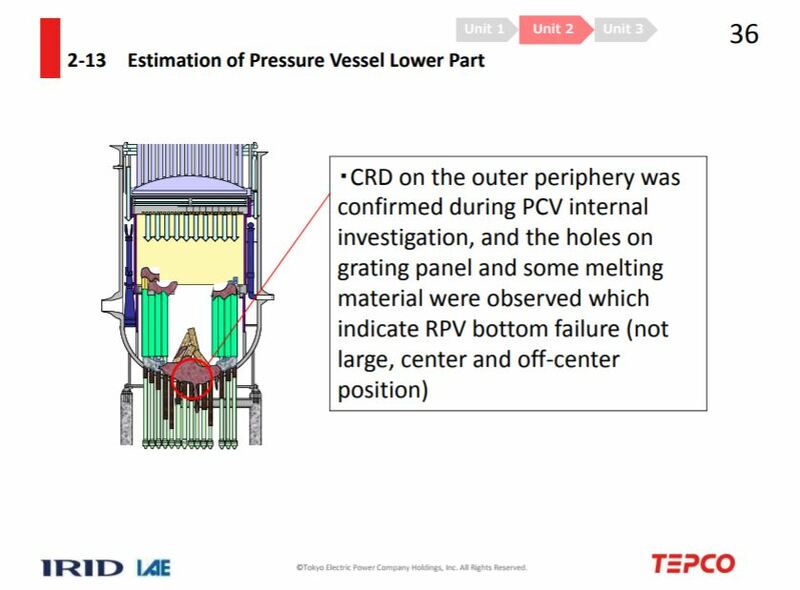 The graphic above notes that they think there were two small melt holes in the bottom of the reactor vessel. The visual evidence of the pedestal area collected earlier in 2017 confirm this. The new conclusions in the NDF report are not really new. Most of this has been known and provides little new insight into the meltdown at unit 2. The efforts to characterize the location of unit 2’s fuel are riddled with flaws. As pointed out in the comments, the lack of damage to the sand pockets of the containment floor is not conclusive that most of the fuel didn’t leave the reactor vessel. There are questions about the interpretation of the muon scans. At this point they have opted to assume the best case scenario that a significant amount of fuel remains in the reactor vessel. A detailed inspection of the pedestal floor would likely confirm the status of the melted fuel, or lack of. Such an inspection may be technically challenging with the current conditions inside unit 2.